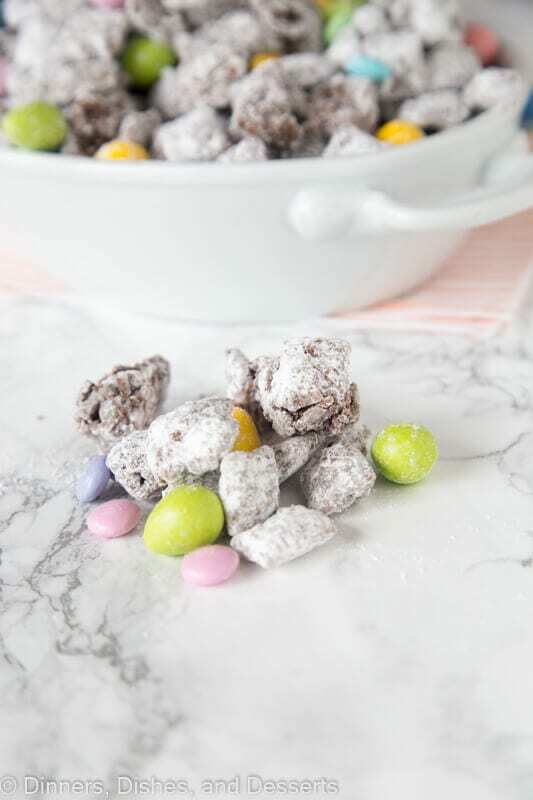 Easter Muddy Buddies – classic muddy buddies taken up a level with more peanut butter and chocolate! Plus decorated for Easter! I can’t believe that Easter is only a couple weeks away! My son’s birthday is April 25th, so Easter means his birthday is soon. Sometimes they are very close, sometimes they are almost a full month apart. This year, less than 10 days apart. So I guess I better get planning for a 12th birthday as well. What do you do for Easter every year? Do you do baskets, coloring eggs, candy, a big dinner and more? We usually do a big dinner, and often times will have my brother and sister in-law over for dinner, where we make my Tangerine Glazed Ham. My son still likes to color eggs. These days he pretty much just wants to eat the hard boiled eggs later, but still likes coloring them together each year. My parents will be in town next weekend, so I am not sure what Easter will be like this year. One thing I do know though, Easter Muddy Buddies will be on the menu. 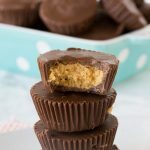 I have a slight obsession with all things peanut butter and chocolate, that is well known by now. 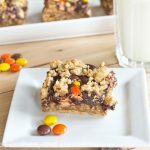 So I can’t just leave the classic muddy buddy recipe alone. 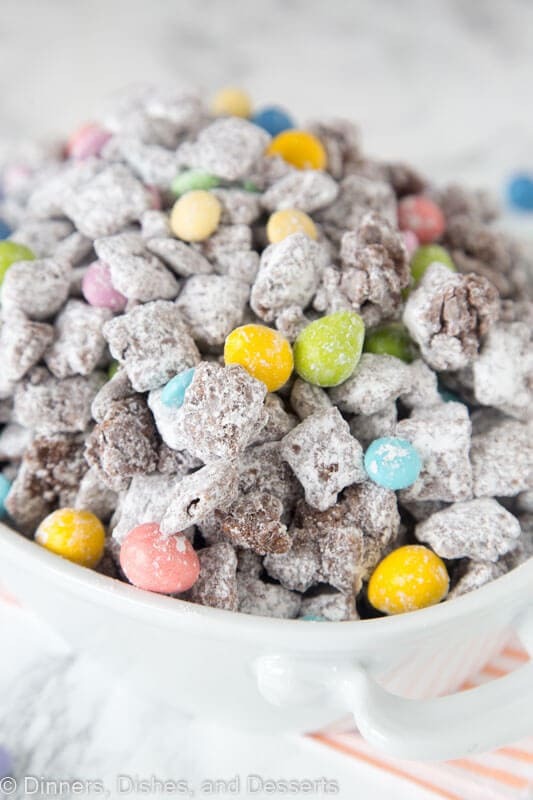 Do you call them muddy buddies or puppy chow? I grew up calling it puppy chow, so I often still call it that today. I posted my Puppy Chow Bars on Facebook once, and I had a couple people yell at me about feeding that to my dog. So maybe I am the only one? And I don’t have a dog, so no worries there. 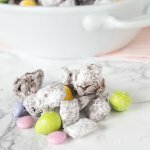 When I make Easter muddy buddies, I don’t just follow the recipe on the box. I come close, but not quite. 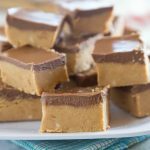 The best part about them is the ones that get stuck together with chocolate and peanut butter. So why not have more of those! 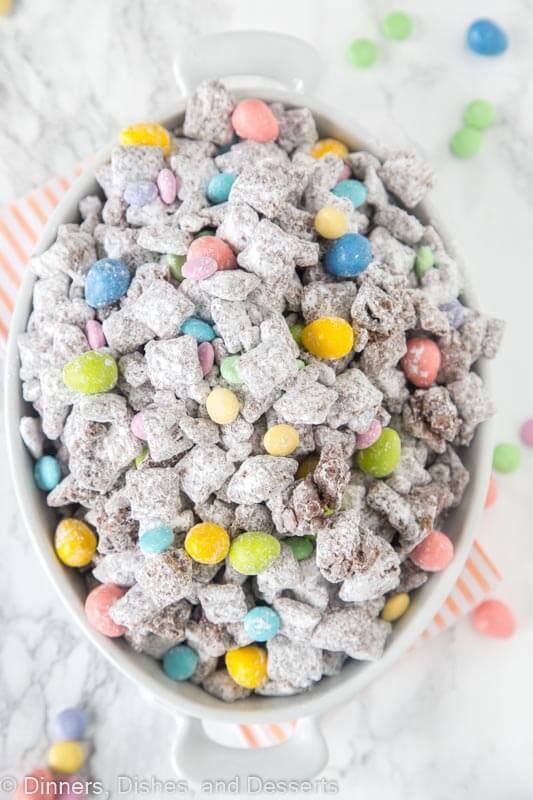 My Puppy Chow (Amped Up) is what we make at Christmas ever year, but today I am taking that and making it for Easter. Because who wants to wait a full year to have puppy chow again? Not me! 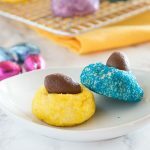 Easter Muddy Buddies - classic muddy buddies taken up a level with more peanut butter and chocolate! Plus decorated for Easter! In a bowl melt chocolate chips, peanut butter, and butter together. Microwave for 1 minute. Stir and heat for 20 second intervals until smooth. Stir in vanilla. Pour over chex cereal, mixing to coat. 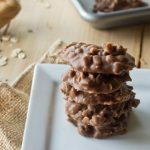 Using a 2 gallon zip top bag (or 2 batches in a 1 gallon size), toss together powdered sugar and chocolate coated cereal. Once well coated, pour onto a baking sheet or wax paper to set up. Once it is set up, stir in 1 cup of Easter candy. 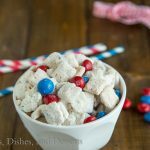 Growing up, this tasty treat was known as “Yuppie Chow” not puppy chow. (Google it) I used to add toasted walnuts too and it was delicious. Crispix cereal had it on the back of their box and it was called puppy chow when I was a kid. It looks kind of like dog food, so it makes sense. Maybe different parts of the country call it different things, but in the Mid-West it was puppy chow. 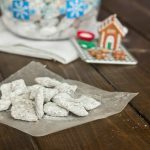 We called it puppy chow – also farfingle’s candied crunch from the crispix box when the grinch movie came out. My favorite story is my very proper aunt loved it that Christmas and couldn’t stop munching. She asked what it was and i told her puppy chow. She spit it out. Took some convincing that it was ok to eat. You can call it whatever you want….I call it delicious! Completely addicting! 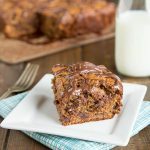 This is such a family favorite! It disappears too quickly! This is dangerously delicious! 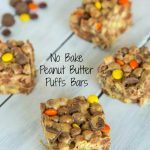 Everyone will need to make a double batch….trust me! 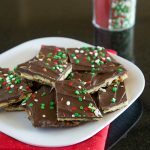 This is one of our favorite treats! I never thought about adding holiday items! So festive! My kids would be all over these! These are so fun and festive! 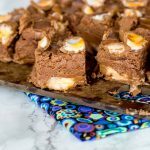 My girls would love a bowl of this at Easter! I’ll be having this for dinner tonight!! Haha, no judging! 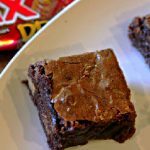 This recipe has all of my guilty pleasures. Can’t wait to make this!